The following will be of most interest to those attending the 'Icelanding Althing' event being held September 26 near Orono ON. Although the Icelandic Althing was centred on legal maters, any time a lot of people gather together is a chance for other activities - trade among them. 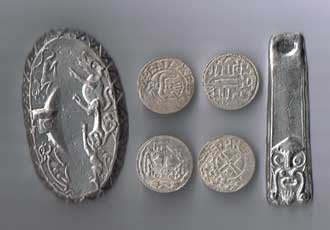 Although a certain amount of barter was still taking place, one of the aspects of the Viking Age was the increased use of sliver based coinage as the means of exchange. Although the Anglo Saxon Silver Penny was closer to 1.5 gm total weight, the years of 'Danegeld' had lowered their silver content to closer to 50%. Although the Anglo Saxon Silver Penny is closer to 1.5 gm total weight, the years of 'Danegeld' had lowered their silver content to closer to 50%. In the spirit of the Althing, a set of trade tokens will be available as exchange at the Althing. These are backed by Master Sylard (and the Wareham Forge). The INGOT shows 'Wolves and Cattle' on a thick oval surrounded by line and dot pattern. It was intended to be used as a guard for a knife (cut a slot to fit the blade). No specific historic prototype, never released to the public. The TOKEN is slightly modified from the event token used at the original Althing, years ago. It's shape is taken from a small whetstone, and has the figure of a Norseman - and original design. Modern currency can be converted into any of these trade tokens either at the Admittance Troll or at my demonstration of coin minting inside the DARC market encampment. You will in effect be PURCHASING these tokens. At the end of the day I will happily REFUND the full purchase amount against any of the tokens returned to me for exchange. 2) The pewter INGOT and TOKEN have no refund value AFTER Sunday September 27. 3) The silver PENNIES remain the standard 'gift certificate' for the Wareham Forge. They may be returned against goods in to the future at their $5 trade value. * 5) Merchants ONLY can make special arrangements to exchange collected tokens for a LIMITED PERIOD (two weeks) after the event. Please contact me directly (info@warehamforge.ca) to make arrangements.